If you’re in the Public Sector, we can make your lives easier. Are you responsible for procurement for any of the following Public Sector organisations? We’re delighted to announce that we’ve been awarded a position on the Eastern Shires Purchasing Organisation (ESPO) framework to supply employee benefits to the Public Sector. The framework reference number is 319. With unemployment the lowest it’s been since 1971* this is an employee’s market. So how do you attract, keep and motivate your best staff? Many of the best employers give their workforce more than just a pay rise, through the addition of an employee benefits package. Valuable to your employees, valuable to you! Salary Extras is designed to put real value at the heart of your employee engagement. By giving your staff benefits that matter to them, in an easy and understandable way, you’ll keep them happy, and with you, for the long term. Our benefits are as diverse as the employees they serve. From lifestyle and health schemes like Cycle to Work, gym membership, dentist and private healthcare plans, to discounts on technology products, leisure and retail schemes and even car leasing, there really is something for everyone. Our experienced Client Managers will talk you through setting up and managing your employee benefits. We'll help you measure the effectiveness of your package so you can be sure you and your staff see the benefit! Your workforce is your greatest asset and a motivated, engaged employee is a gift that will keep on giving. Having a diverse range of employee benefits will help you not only retain your best staff but also attract fresh talent from outside your business. In this blog we’ll go through some of the key advantages of having employee benefits. It’s been said before but the modern day employee is looking for more than just a salary when looking for a new job. Alongside things like work-life balance, flexible working and a pleasant working atmosphere, the importance of an employee benefits package should not be underestimated. It’s a fantastic way to stand out from the competition in a saturated market and attract the best talent. 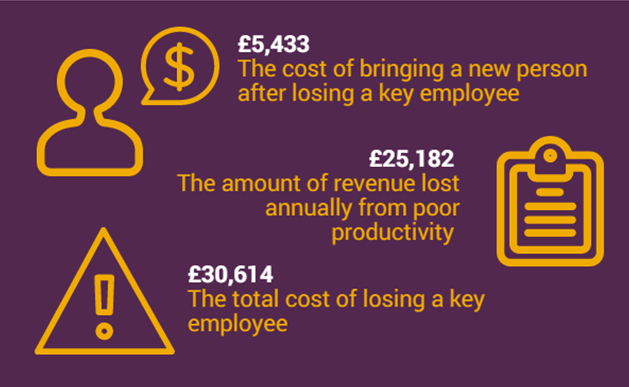 With the estimated cost of losing a key employee standing at £30,000, it seems a no-brainer that you’d want to keep your best staff. A comprehensive employee benefits package can play a big part in that and companies that offer employee benefits have far less employee turnover than those that don’t. If you want to keep your best employees and build a real team of experts around you, make sure your benefits are up to the mark. Employee benefits can do wonders for staff morale too. You can offer them the latest technology, holiday trading, discounts on everyday essentials, the list goes on. The key to a happy workforce is asking your employees about the benefits they’d like, and tailoring your package to suit their needs. It shows that you’re willing to invest in their wellbeing and future success. Employee benefits are also a great way for you and your staff to make real savings. You’ll save money on your tax and National Insurance (NI) contributions depending on the schemes you offer - which can be reinvested elsewhere. And your employees can save hundreds of pounds a year on everyday essentials, one-off purchases and even health care. Offering employee benefits that promote the health and wellbeing of your employees is fast becoming a vital part of any company’s strategy. Dental plans, health insurance and gym memberships do more than just attract employees, they’ll keep your workforce healthier, happier and more productive. The same goes for their financial health. Share plans, pensions and a money advice service can help them save for the future, and give them peace of mind. Introducing policies that encourage a healthier work-life balance will help you to reap the benefits of higher productivity, lower absenteeism and a happier, less stressed workforce. For more information on the best way to get started, email us at salary-extras@computershare.co.uk. Update on #SaveChildcareVouchers campaign – your voice is being heard! At the end of last year, you amazing people successfully managed to smash the petition target of 100,000 signatures needed to for a Parliamentary debate to keep the childcare vouchers scheme open. In March of 2018, the Government debated and announced they would keep childcare vouchers open for new entrants* alongside Tax-Free Childcare (TFC) for another 6 months, taking the deadline from April to October 2018. With just a few weeks before the childcare voucher scheme is set to close to new entrants, opposition MPs in Parliament have signed up to support keeping it open – your voice is being heard! An Early-Day Motion, stating the government should not close the scheme without a proper analysis of the winners and losers, calls for MPs to have the opportunity to debate and vote on the proposed changes in Parliament before they are fully implemented. Many ordinary working families stand to lose out if childcare vouchers close to new entrants on 4 October 2018 - and time is running out. We believe the childcare voucher scheme being open alongside Tax-Free Childcare (TFC) gives parents like you a genuine choice for the support that best suits your family. We want this scheme to continue beyond October and with your help, we know we can do it! Whether you’re a parent, an employer, or a childcare provider – please see below for ways you can help. 1. Contact your local MP. Ask them to sign the Early-Day Motion and put pressure on the government to keep childcare vouchers open – it’s free, easy to do, and takes less than five minutes. Just visit www.theyworkforyou.com, enter your postcode to find out who represents you, and click on the green “Send a message” button to contact them. Encourage your networks to write to their MP so that all parents can have access to childcare vouchers beyond October. As the deadline to join the scheme approaches, they may lose out unless the government keeps it open. Use Facebook, Twitter or LinkedIn to demonstrate your support for the #SaveChildcareVouchers campaign and follow @Save_CCV for important news and updates on the campaign. Visit this page to see some simple social media posts you can just copy, paste and post! Click here to find out more about our campaign to #SaveChildcareVouchers and find out how you can help spread the word to keep the scheme open to new entrants* beyond October. * Please note, parents who are already on the childcare voucher scheme, and have had at least one childcare voucher taken from their pay in the last rolling 12-month period, can stay on their employer’s scheme for as long as they remain eligible, even if the scheme closes. Communicating effectively with your employees can prove to be a tricky balancing act. Do too little and you run the risk of having no engagement with your staff. Too much and your employees may become tired of constantly hearing from you. In this blog we’ll give you a very quick overview of five employee communication mistakes you should try to avoid. The most important thing is to…K.I.S.S - keep it simple, stupid! We see so many examples of internal comms where the reader is bombarded with detail - it’s not necessary. Keep the messaging in your comms as simple as possible, and give employees the opportunity to find more information elsewhere. Another big mistake employers often make is sending their communications out sporadically, with no real plan or strategy behind them. Make sure you have a clear strategy and agreed timeline, so that the messaging can have maximum impact. Also clearly identifiable branding will help employees buy into the concept you’re trying to convey. On the other side of the coin, you definitely don’t want to send your communications too often. Once a week is more than enough where internal communications are concerned! It might be worth creating a weekly/fortnightly internal newsletter that covers all the hot topics and that your employees expect to see in their inbox. It will also mean that if you need to say something that is business critical (out of the norm) your employees are more likely to pay attention to it. It gets said all the time, but one size definitely doesn’t fit all. While younger employees might like an email, vlogs or a social media campaign on your internal social network about a new benefit, older employees or those who are field-based might prefer something more traditional, like a face-to-face meeting or a letter through the door. You’d be amazed how many employers feel like they don’t have to put any effort in when communicating with their employees - the attitude is just ‘send it out and tick that box’. Ask yourself the question, would you act on a marketing email from a retailer if it didn’t grab your attention? So why should your employees behave any differently when presented with boring internal comms? Let your creative juices flow! Make sure you check out our other blogs where we’ve got even more top tips for you to get the most out of your employee engagement. Choosing an employee benefits provider to suit the needs of your workforce will be one of the most important decisions you’re likely to make. After doing all that legwork to understand the benefits your employees want, don’t ruin it by choosing a provider who’s not a good fit for your business. If you get it right, it can really help you retain and attract top talent. Get it wrong, and it can be a costly mistake. Make sure you do your research - there’s no such thing as too much. Trawl the internet, ask questions, go to employee benefits events, make phone calls and ask contacts in the industry for their advice and recommendations. 2. Understand their technology and capability – can they provide what you need? Technology and smartphones have changed the way we absorb information. Employees want their employee benefits available to them at a touch of a button. A platform that offers everything in one place and is mobile optimised will have far higher levels of engagement. 3. What sets a provider apart from their competitors? Don’t be afraid to ask the important questions. What does your prospective benefits provider do that others don’t and how do they differentiate themselves from their competitors? Ask for examples of the work they’ve done for other companies. 4. Does the provider know the market you work in? When it comes to employee benefits, one size definitely doesn’t fit all. Just because your prospective provider has a good track record in one industry, that doesn’t mean they’ll work well for you. Look for an experienced provider, who has a proven track record of working with companies of all shapes and sizes, across a really diverse range of sectors. 5. How much support do they offer their clients? It’s all very well choosing the slickest-looking provider, but once you’ve signed on the dotted line, can they walk the walk? Reputation will follow companies around. If it seems like a provider doesn’t offer enough support to their clients, they’re definitely worth avoiding. Remember, research (yes, we said it again) is key, if you do choose to look for a new provider, make sure it’s the right decision for you and your employees. If you need help mapping out the process, download our checklist. If you’re still unsure how to get started, or would like more information, feel free to get in touch at salary-extras@computershare.co.uk. With the estimated cost of losing a key employee standing at £30,000*, can you afford not to keep your employees engaged? It’s no secret that engaged and motivated employees are productive employees. And with UK productivity falling behind other western countries, it’s time to give employee engagement more of the spotlight. 1. Have a tailored benefits package to suit your workforce. Everywhere we go, we expect choice, convenience and a personalised experience, and employee benefits are no different. Get to know the people that work for you and find out what they like, that way you’ll design the best package for them. 2. Acknowledge employees who ‘go the extra mile’. Employees want to be recognised for their hard work, and often it’s something as simple as a ‘thank you’. Make sure you have a variety of rewards too - big or small they can make a big difference to morale. 3. Communicate with your employees effectively. Having good two-way channels of communication at company, team and individual level is crucial. Helping your employees understand their role in company performance and how they can contribute will create a sense of inclusivity. 4. Set clear objectives. The objectives of your employees should align with those of the business. That way, there’s a greater connection between an individual’s actions and company performance. 5. Be flexible. We all strive for that perfect work-life balance. Allow your employees a degree of flexibility around their role. For example working from home, or changing their hours to fit around family commitments, study, or phased retirement will make them feel more valued. You don’t necessarily have to use these five tips and you may feel there are other options better suited to your company, but having key areas to focus on can help you develop a happy workforce. An engaged workforce is the gift that keeps on giving - it can improve morale, boost productivity and create a better working environment. Your employees will feel valued and motivated, and genuinely know that they contribute to the overall success of the company they work for. *According to Recruiting Times, it costs the average company over £30,000 to replace a key member of staff - you can lose £5,000 during the recruitment process, and once you’ve found them, you’ll need roughly £25,000 to get them up to speed. Thanks to technology, smartphones and social media, the world of internal communications has come a long way in a very short space of time and a generic approach to communicating with your employees, simply won’t do. The aim of any internal communication is to leave the person informed, educated, motivated and above all engaged. Figures show that companies with engaged employees outperform those without by a staggering 202% (Source: Dale Carnegie). So it begs the question, is it time to rethink your internal communications strategy? Why is it so important to engage with your employees? Effective internal communications is a great way for employees, old and new, to understand the company, its values and the business objectives. And they play a key part in delivering your employee engagement strategy. So how do you deliver the gold-standard of internal comms? Get to know your employees, learn what makes them tick, and listen to what they have to say! Surveys are a great way of doing this – you can gather a wide range of information from a large percentage of your employee base. Other ways can include focus groups, an employee forum with a select few individuals who represent the views of all employees, Q&A sessions between management and employees, and an internal social media platform that encourages employees to engage with one another on a variety of topics. Tailor your messaging so that it’s relevant. But don’t feel the need to bombard your staff with emails. Keep the content short and sweet – with a mixture of useful, ‘need-to-know’ pieces, and more light-hearted ‘nice-to-know’ things like employees who have received awards for going the extra mile at work or doing charitable work in their community. > Use accessible channels – email, internal intranet pages and social platforms can prove to be very popular, and can make your life far easier. > Other channels – Team meetings, Town Halls, video updates and focus groups are also great ways to communicate with your employees. Another thing to remember is that some companies will have a large amount of field-based employees, so digital communications will be less effective and traditional forms of collateral might work a bit better. With the advent of the government’s Tax-Free Childcare initiative, the childcare voucher scheme was due to close to new entrants on 6 April 2018. However, ministers announced yesterday (13 March 2018) they are to delay the closure. Education Secretary Damian Hinds made the concession during a Commons debate. Speaking in Parliament, Mr Hinds said: "I can confirm that we will be able to keep the voucher scheme open for a further six months to new entrants." Childcare vouchers will now close to new entrants in October 2018, with the actual date yet to be confirmed. Existing users will be able to continue benefitting from the savings provided by childcare vouchers as they always have. "While childcare vouchers are going to remain open for a little longer, this reprieve is only temporary. Employers should use the current momentum to get as many working parents onto the childcare voucher scheme before the new deadline," said our Managing Director, Voucher Services, Julian Foster. "Research shows that families with childcare costs under £9,330 a year are likely to be better off with childcare vouchers, tax credits, or a combination of both. "Parents just need to give themselves a choice - and by registering for childcare vouchers before the new deadline, they will always have the option to switch to Tax-Free Childcare at a later date (if that ends up being the better scheme for them)." Reward and recognition is fast becoming embedded in many companies’ cultures, so if you don’t offer reward and recognition, you really should! It’s no longer just a nice thing to do for your employees, it’s a communication tool that rewards positive behaviours and, if used properly, maximises engagement and motivation in the workplace. In a highly competitive job market, where talented employees are beginning to ask the question, “What’s in it for me?”, prioritising reward and recognition can really help you stand out from the crowd. So, if you think your company would benefit from a Reward and Recognition programme, or if you already run one we’re here to help. It seems logical that most employers would want to recognise their employees for doing a good job but, for many, a Reward and Recognition programme doesn’t form part of their employee engagement strategy and is simply seen as a nice to have – which is an opportunity missed. It’s not a one-size fits all approach. Any Reward and Recognition programme should have a clear objective, closely aligned with the core values of the business. It doesn’t have to be expensive either, not all rewards are financial or tangible – simply taking the time to say ‘thank you’ can be just as effective. You can take this to the next level with staff engagement events – when it comes to thanking your staff, the sky’s the limit! You may be reading this and thinking ‘this is all very well and good, but I just haven’t got time to devise and implement a Reward and Recognition programme’. It needn’t be a huge, time consuming undertaking. Just set aside a small amount of time each week, and just achieve as much as you can in that time. You’ll be surprised how much you can get done. Alternatively, just give your employee benefits provider a call – they should be able to pick up any jobs you don’t have the time to do – no matter how small. Like any employer tool, implementing an effective Reward and Recognition programme takes work and there will be challenges along the way – mainly to the ‘bottom line’ and trying to keep everyone happy when choosing the right rewards. If money is a concern, you could start by simply offering ‘recognition’, and once it’s embedded in your company culture, you could look to enhance with rewards – with or without a monetary value. 1. Create a culture of recognition – Simply put, this means Reward and Recognition is embedded in everything you do, from staff training and brand values, to company culture. A clearly-communicated, easy-to-understand means of recognising your employees will really pay off: you get the actions and behaviours you want to see the most, and your employees see themselves as effective contributors to the success of the business. 2. Stick to it – It’s all very well saying you want to create a culture of reward and recognition but it needs commitment and consistency from everyone to make it work. Build this into your manager training, and get into the habit of celebrating success so that employees can really see the benefit of the programme. 3. Choose the right rewards – Often employers can be put off by the thought of having to part with money in the form of financial rewards but this doesn’t have to be the case. An extra day’s holiday, a sought-after car parking space or an on-site event could all be given as recognition to a team member for minimum outlay. Things like e-cards - or even a simple ‘thank you’ - can also go a long way to making an employee feel valued. It’s important to remember that the timings of these rewards is also crucial. Recognition should be given as quickly as possible, so as not to seem like an after-thought. If you use these steps as the foundation for effective employee recognition, you’ll hit the ground running. Find the approach that works best for your employees and make this the year of reward and recognition. With an ageing population in the workplace, promoting policies and behaviours that support health and engagement can lead to a happier, more productive workforce. Back in 2015, futurologist Rohit Talwar predicted that people born in the early 2000s would live to be 120, and likely work until they were 100. Whether or not Mr Talwar’s prediction proves correct, it’s no secret that Britain’s workforce is getting older. According to the Office for National Statistics, UK population growth will be weighted towards the older population. By 2030, the number of people in England above the age of 65 will increase by 50% compared to 2014. And, according to the Department for Work and Pensions, in 2014, more people aged over 50 were in work than ever before. The gradually rising pension age over the next decade will also play a part. So what can be done to ensure older workers remain motivated and content in their roles? The myth that millennials and young parents are the only demographics who want to work flexibly was debunked long ago. People aged 50 and over are fast becoming one of the biggest groups in need of a flexible approach to work. And, as the forced retirement age no longer exists, many people are choosing to continue working, though possibly more flexibly. Why? The first answer is probably the most obvious. As people get older, they’ll likely need to reduce the number of hours they work. While this is especially true of manual workers, their office-based counterparts will benefit from being able to work from home more. Meanwhile, something a lot of people fail to consider is that older people provide a great deal of care for relatives. Carers UK estimates that, by 2037, there will be 9 million people providing unpaid care in England and Wales, and that this is “likely to be more common among older workers”. A study by the Trades Unions Council shows that women over 50 have extensive caring responsibilities, with more than 50% caring for at least one of their parents, 39% for their children, 21% for their grandchildren, 13% for other elderly relatives and 9% for a disabled relative. Taking this into consideration, offering employees help when navigating the care system will pay huge dividends, not only for your employee and your company, but in a wider social sense, too. In our experience administering employee benefits packages, we’ve found that older employees are more interested in financial education than any other group. The process of providing guidance on pensions and savings feeds through to other aspects of financial education, which most employers don't have the resources and skills to provide. But research shows individuals want to use a third party, such as the government's Money Advice Service which offers free and impartial money advice, tools and calculators, online and over the phone. While pension planning should be done carefully, and throughout an employee’s working life, as they approach the point when they draw their pension, it’s important that employees are given as much guidance, education and support as possible around their options. It’s also important to remember not to overlook older employees when recruiting. Whether internal or external, there are a lot of highly skilled and well experienced employees out there. Remember, if you lose older employees, they take a wealth of experience with them, which can have a negative impact on your business. 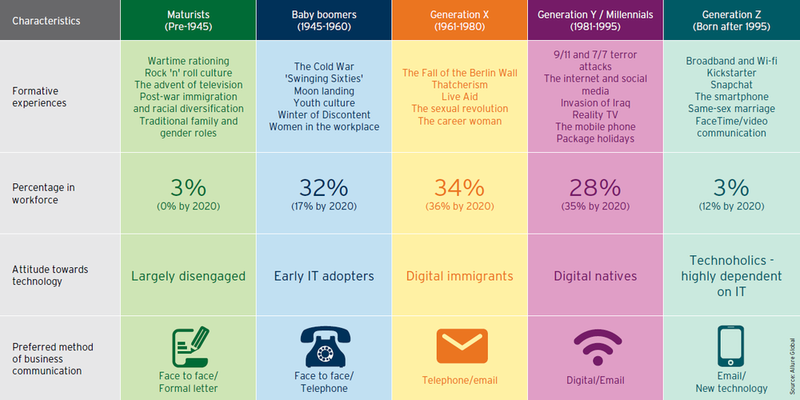 For these reasons, it may be wise to devise an Ageing Workforce Strategy. Just be sure to think of older people when you have a recruitment drive, offer your older employees retraining opportunities and train your managers to avoid bias towards younger older employees. Of course, if you’d like to do more to help your older employees to thrive, so much the better! A comprehensive set of health and wellbeing initiatives is the cornerstone of any good employee benefits package. Much like pension planning, health programs are important to your employees for the duration of their working lives, whether they know it or not. As well as offering things like subsidised gym memberships, bike schemes, and a good work life balance, it may be worth targeting certain initiatives specifically for the benefit of your older employees. Health assessments and screenings, health cash plans, gym classes specifically for the older generation, and on-site education about ailments typically suffered by older people will help keep your workforce happy and healthy. This will also reduce absenteeism and presenteeism, which is no bad thing. If you use the Salary Extras platform, or you’re interested in employee benefits, get in touch today to see how we can help you. > The need for working parents to receive a childcare voucher by 5 April is a very different approach to that adopted by HMRC in 2011, where setting up a first order (up to 12 months in advance) by the deadline was all that was required. What is our view on this information? > In addition to the recent two-hour government debate on the petition to keep childcare vouchers open, the Tax-Free Childcare scheme is currently under a lot of scrutiny - by Parliament, the Treasury Select Committee and the media - as a result of the issues parents are experiencing. We have contacted HMRC for clarification of this new rule via the Childcare Voucher Providers Association (CVPA), but are still awaiting a response from them. It’s important to remember that, as a childcare voucher provider we are here to offer guidance based upon the available facts, but do not have any further information beyond what is stated on the HMRC website. > It’s important to get all working parents signed up to childcare vouchers today, so they receive a childcare voucher by 5 April. Once on the scheme they can take their time deciding which scheme is best for them (they can always switch to TFC at a later date). > All parents who have previously registered for childcare vouchers must receive at least one voucher in every rolling 12-month period. If their eligibility has lapsed i.e. it’s more than 12 months since their last order, they need to receive a voucher before the April deadline. > Many parents won’t be eligible for TFC and will be better off with childcare vouchers, tax credits or a combination of both. Getting them registered for childcare vouchers is the best way to ensure they can take the time to choose the best solution for them. Regardless of their contracted hours employees should find their time at work rewarding, challenging and engaging most of the time – if it’s not don’t be surprised if your staff turnover shoots up! The cost of replacing a key member of staff can be astronomical in comparison to the cost of some small tweaks you can make to your company ethos to ensure you retain them. According to Recruiting Times, it costs the average company over £30,000 to replace a key member of staff - you can lose £5,000 during the recruitment process, and once you’ve found them, you’ll need roughly £25,000 to get them up to speed. So what does employee engagement mean, and why should I care about it? An engaged employee is someone who is passionate about their work and believes in the company they work for. In short, this means they are enthused about doing their best for the company, but will also embody the brand’s core values, as well as extolling the virtues of the company to anyone who’ll listen. This is not only good for productivity, but also for your bottom line. > How many staff have you lost in the last year and what were their reasons for leaving? - Was it lack of opportunity to move up or around within in the company, or lack of challenges and motivation? > Do your line managers understand how to retain employees? > Are your staff willing to ‘go the extra mile’ or do they just turn up, clock in and clock out? > Are your staff happy and satisfied with their roles? By asking these questions, you should be able to see if your staff are truly engaged. Perhaps unsurprisingly, employee engagement is closely linked with reward and recognition. Do you have processes in place to make sure pay, benefits and recognition are regularly reviewed and fit for purpose? If staff feel they will be rewarded for their hard work, whether monetarily or through a simple ‘well done’ they are much more likely to be engaged. Having the opportunity to learn and develop is also crucial to engagement. Making sure your staff have access to training can make the difference between someone leaving to find the development they need and sticking where they are. It’s also important that managers have good leadership skills and know how to successfully motivate and support their teams. A bad manager can wreak havoc on employee engagement, and will always be high on the list of reasons for people leaving a role. If you’re still unsure if your employees are engaged, ask them! Short surveys, one to ones and employee focus groups can have a really big impact, and may shed light on areas you didn’t know were a problem. These often include things like work-life balance, the ability to work flexibly and employee benefits. For more on how to do this, and measure it, take a look at our blog post from 2016. Remember: Employee engagement is a mutual relationship. It simultaneously meets the needs of the company to be successful, and the needs of the employee, for whom work should be both satisfying and rewarding. Look around your office. Is everyone the same age? Does everyone have children? What stage is everyone at in their career? What are their hobbies and interests? Even in the smallest offices, it’s obvious that no two people are exactly alike. For this reason, taking a one-size-fits-all approach to employee benefits just isn’t going to work. Taking the time to get to know your workforce and find out what makes them tick will pay huge dividends. While everyone’s different, in our experience administering employee benefits packages, we’ve noticed that quite often people of the same generation or experiencing the same lifestyle trigger (buying a house, getting married, having children…things that don’t necessarily follow age…) tend to go for similar benefits. How can I tailor my benefits? Get to know your workforce! > How old are they? > How many of them have dependents? > Do they have a lot of disposable income? > What do they value most? > What are their worries? > Are they comfortable with technology? Okay, so what are the next steps? > Challenge yourself to review your benefits every few months, and don’t be afraid to change anything that isn’t working, as well as building on whatever’s performing well. Our employee benefits packages are hugely varied - you can pick and choose as few or as many as you want, as well as build upon them over time - allowing you to truly tailor your offering to your employees’ needs. Flexible working is a hot topic at the moment. At a time when 87% of UK employees either work flexibly already or would prefer to, and 95% of firms now offer some form of flexible working, it’s still one of those subjects that employers and employees alike are reluctant to talk about. Before I get started, I should mention that if you offer flexible working and your employees are fully engaged and motivated, then the things I advise in this blog are probably solutions you're already using. If that's the case, great - keep up the good work! But ask yourself is there nothing about your flexible working policy that could be improved? Be honest. If you think there's room for improvement...read on. To help start the conversation, I’m going to look at the myths surrounding flexible working, and do my best to dispel them. I already offer my staff flexible working – what’s the problem? It’s not enough to just offer a flexible working strategy as a tick box exercise. The vast majority of firms offer flexible working, yet as 77% of flexible workers say they feel ‘trapped’ in their roles, there’s definitely a problem with how it’s being administered. When re-thinking your approach to flexible working, it makes sense to start at the beginning – the recruitment stage. When advertising roles, make sure you let potential recruits know you offer flexible working and you’ll reap the rewards. According to DigitalMums, three quarters of 18- to 24-year-olds not working are more likely to apply for a job with flexible hours over a standard job. It’s also important to look at how many requests you’ve received for flexible working and how many have been accepted. Make sure you’re not rejecting requests just because it needs time, effort and a bit of commitment from you to accommodate a flexible working request. Another thing to consider is to make sure you nurture a culture where staff feel it’s OK to ask for flexible working - DigitalMums recently reported 51% of UK employees think asking for flexible working hours would be viewed negatively by their employer. This reluctance is highest amongst millennials, with 40% saying they’d be too nervous or worried to ask for flexible working hours. Also, make sure your flexible working policy has moved on from just people with children. According to Timewise’s Flexible Working study, only 3 in 10 people cite childcare as the reason for wanting to work flexibly. Nowadays, flexibility is welcomed across whole employee demographic – by everyone from millennials to mums returning to work to older employees. Allowing employees to set their own hours and come and go as they please has got to be bad for business, right? Wrong! Studies have shown it’s great for business to give your employees the autonomy to decide their working hours, right down to the time they start and finish work, and where they do their work. In the main, this is down to the satisfaction and motivation that a flexible working structure gives to the employee. And of course, the happier your workforce, the fewer P45s you’ll have to deal with. The Balance argues that flexible working can have a number of positive influences, from helping employees meet family needs to increased feeling of personal control over schedule and work environment. In this article from the Guardian, Natalie Pancheri, HR Policy Adviser at the London School of Economics (LSE) agrees. “The benefits of flexible working are well established, from increased employee engagement to better performance,” she says. It seems like offering flexible working will solve all my company’s problems with recruiting and retaining the best staff! While flexible working will likely help attract the best talent and ensure they stay with your company for longer, there’s no getting away from the fact that it can be hard work, and a lot of businesses face challenges when adopting flexible working policies. For example, staff are always needed at a certain peak time, which means some requests have to be rejected. Now and again, flexible working agreements won’t work with certain employees. There needs to be an open dialogue to ensure there is no resentment and the employee doesn’t end up losing motivation. If you offer flexible working, yet your attrition rate is still high, or productivity is low, the best way to start would be to ask your employees how you can make things better. It’s also important to remember that employee benefits don’t exist in a vacuum. Having a varied and wide-ranging employee benefits offering is essential in attracting, engaging and retaining the best talent in your industry. It stands to reason, then, that the companies that grasp the nettle and offer their employees a more flexible approach will thrive, while those that choose to wait to be approached about it will be left behind. A big thank you to everyone who signed the petition – we’ve smashed the 100,000 signatures needed and a date (15 January 2018) has now been set for the petition to be debated in parliament. If you signed the petition, or visited the petition page, you will have seen the government’s response. It pitched TFC against childcare vouchers rather than both schemes running alongside each other, as the petition called for. The Childcare Voucher Providers Association (CVPA) believes there are some important facts to understand about the benefits of childcare vouchers that parents are set to lose. It has been said that TFC is fairer and better targeted than vouchers, but this doesn’t take into account that families would lose all support under TFC if one parent was not in work for any reason this could be an unexpected job loss or having to stop working to look after an elderly relative. With Childcare Vouchers, the family would still receive support where they wouldn’t with TFC via the other working parent. The average family will be able to claim more support with Childcare Vouchers. Tax-Free Childcare is often said to offer £2,000 of support, but this is based on a family spending a total of £10,000 a year on childcare, with £8,000 out of their own pocket. Most families cannot afford this. In fact, according to the Government’s figures, the average family spends £3,276 on childcare each year. This family would only receive up to £655 of support under TFC but could receive up to £1,866 with Childcare Vouchers. It is also important to acknowledge that anyone who claimed TFC would lose access to any other working tax credits and universal credit, and these other benefits would still be available to a family using Childcare Vouchers. It is also sometimes claimed that TFC is “fairer” to single parents, but single parent households could still be worse off with TFC. As a single parent paying standard rate tax would have to spend over £4665 on childcare to be better off with TFC than with Childcare Vouchers. It is precisely instances like this that shows us the importance of keeping both schemes open. People sometimes think Childcare Vouchers has restricted access, but well over 20 million employees of the 31 million in this country can access vouchers. This includes everyone who works for any public sector body and any large employer. And this number is growing by the day. Even with the threat of closure over 1000 new small and medium sized businesses sign up to join the Childcare Voucher scheme every month. Hopefully you’ll be able to see why we think it is so important that we keep Childcare Vouchers open. Getting an employee benefits programme off the ground can be a big undertaking, so once it’s in place it’s easy to sit back and hope your employees are getting what they need. But just how effective are your employee benefits? The possible removal of salary sacrifice arrangements means it’s going to be even harder to prove the return on investment in employee benefits. With that in mind, here’s a few tips on how to measure their value. Why should you be measuring? Employee benefits are a great way to show your staff you value them. They also provide perks that are a lot easier to instigate than a pay rise. It’s really easy to tailor to your individual workforce’s needs, meaning you get even more bang for your buck. However, if the tax and National Insurance relief of benefits in kind are removed, it will be harder to prove that employee benefits are worth the investment. In most cases, it’s inevitable that some benefits will have to be dropped. It will therefore be even more crucial for employers to know which benefits are important to their staff, and, in turn, should be renewed. Having a clear idea of the value of your employee benefits helps you to meet company targets regarding employee satisfaction and retention. An Employee Insight report conducted by Capita in 2015 stated that ‘66% of staff would be more likely to stay with an employer that offered good benefits’. If you’re still wondering why you should keep staff then the below infographic should tell you everything you need to know. Unmotivated staff leads to higher attrition, and training new employees can cost in excess of £30k. If you have a high staff turnover, sickness rate and a work force that seems fed up, then your employee benefits aren’t doing their job. These factors are not only going to drag your profits down, they also all feed into one another, so nipping them in the bud is very important. If you want to know whether you’re getting a good return out of your employee benefits programme, then why not ask the users? If your scheme is falling short of your targets or you simply want to keep making improvements, speak to your staff. They will be able to tell you what benefits would be appealing. According to The Benefits Research 2014, 41% of companies say they introduce or change benefits based on requests from their employees. You can get feedback by running surveys, from informal conversations or via appraisals. The most important thing is to keep staff involved. For an unbeatable level of insight, online benefits platforms like Salary Extras give you the opportunity to track engagement - view log-in numbers, how frequently people are logging in, whether or not they are making selections, etc. Now you have your results – it’s time to review your employee benefits offering. Most packages can be renewed annually, but research by Unum shows that over 50% of businesses have not reviewed their packages since 2008. Feedback is crucial to make sure money is spent in the right place. Don’t be afraid to change the range of benefits you offer. If your employees are getting the best employee benefits then they are unlikely to be looking anywhere else – but that shouldn’t stop you. Staying ahead of the competition and checking out other people’s ideas is also a great way to keep up to date with the latest perks. LinkedIn are a great example of how to shake things up and make waves with your employee benefits, offering everything from educational grants to yoga. As your business grows and changes, it’s important to review your supplier and how well their service matches your needs. And, as with any other service, it’s important to keep negotiating to ensure you have the best value scheme. If you haven’t been measuring the value of your employee benefits, then it’s not too late – start now! When one third of all doctors’ notes signing people off work are now for mental health issues and stress  , it stands to reason that mental health in the workplace can’t be ignored. Turning a blind eye to mental health will cost you productivity, workplace morale and ultimately your valued and talented staff. What impact will the Autumn Statement have on the future of employee benefits? On 23 November 2016, Chancellor Philip Hammond delivered his 2016 Autumn Statement and with it, significant changes to employee benefits. Employee engagement - why is it important, how do you achieve it and how do you measure its success? Perhaps we should start at the beginning, and take a look at the definition of employee engagement. Are you thinking of running a Technology Scheme this winter? The recent salary sacrifice consultation, which closed on 19 October, is causing a bit of a headache for those employers with enrolment windows happening during this period of unrest. The consultation proposal didn’t mention offering Grandfather Rights to those employees already in a scheme that could be affected.